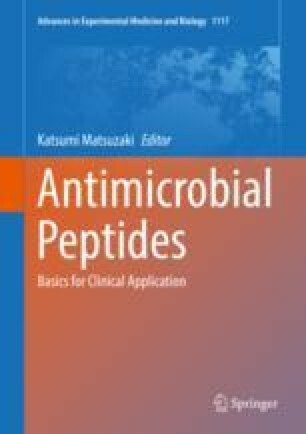 To elucidate the mechanisms of action of antimicrobial peptides (AMPs) and to develop de novo designed peptides with activities similar to those of AMPs, it is essential to elucidate the detailed processes of AMP interactions with plasma membranes of bacterial and fungal cells and model membranes (lipid bilayers). In this mini-review, we summarize the present state of knowledge of the interactions of AMPs with lipid vesicles obtained using the single giant unilamellar vesicle (GUV) method. Currently, three modes of action of AMPs on GUVs have been defined. The elementary processes of interactions of AMPs with lipid vesicles revealed by the single GUV method, and the advantages of this technique, are described and discussed. For example, the single GUV method can be used to determine rate constants of AMP-induced pore formation or local rupture and membrane permeation of internal contents through the pore or the local rupture, the transbilayer movement of lipids, and the relationship between the location of AMPs and pore formation. Effects of membrane tension and of asymmetric lipid packing in the bilayer on AMP-induced pore formation also are described. On the basis of these data, we discuss the present state of understanding of the interaction of AMPs with lipid bilayers and future prospects for AMP studies.